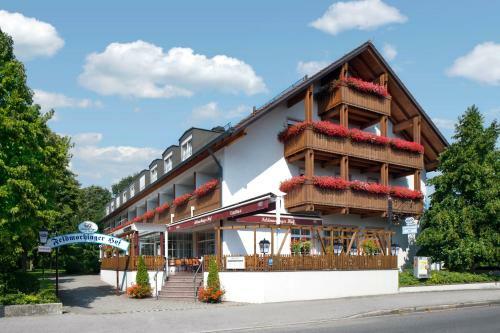 A traditional Bavarian restaurant, free Wi-Fi, and non-smoking rooms with cable TV are offered by this 3-star hotel in the quiet Feldmoching district of Munich. The Old Town district is a 15-minute drive away. The family-run Feldmochinger Hof provides spacious rooms and suites with cable TV. Some of the rooms have a private bathroom, and all bathrooms were renovated in 2013. Some rooms also include a large balcony. Varied buffet breakfasts and regional specialities can be enjoyed in the Hof’s country-style restaurant. Guests can try freshly tapped Hacker-Pschorr beer here. München-Feldmoching Underground and S-Bahn Train Station is 1 km away from the Feldmochinger Hof. Trains run to the famous Marienplatz Square in 20 minutes. Parking is free at the Hof.